<!-Eric Gill. 1882-1940--> Eric Gill. Animals All. 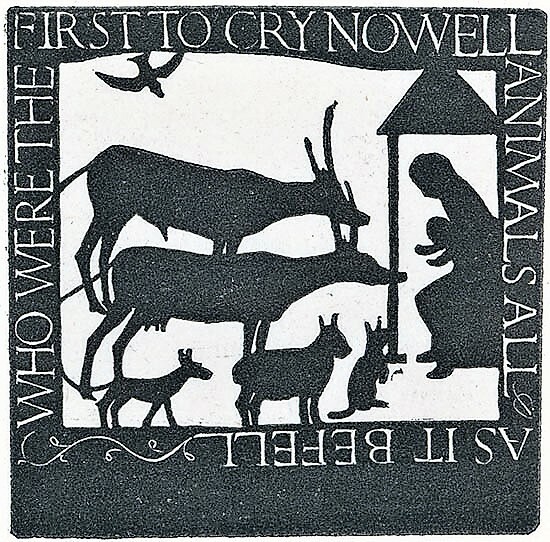 Animals All: WHO WERE THE FIRST TO CRY NOWELL ANIMALS ALL AS IT BEFELL. 1916. Woodcut. Physick 50. 2 1/16 x 2 1/16 (5 x 3 7/16). As published in Engravings by Eric Gill Douglas Cleverdon, Birmingham, England, 1929. Printed on simili-Japan paper. Signed in pencil. $1,250.